MultiGreens Capsules are a nutritious chlorophyll formula designed to boost vitality by working with the glandular, nervous, and circulatory systems. * MultiGreens is made with spirulina, alfalfa sprouts, barley grass, bee pollen, eleuthero, Pacific kelp, and therapeutic-grade essential oils. 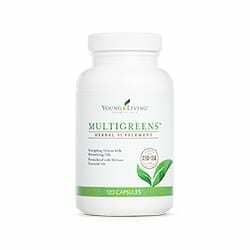 MultiGreens Capsules is a nutritious chlorophyll formula designed to boost vitality. * MultiGreens is made with spirulina, alfalfa sprouts, barley grass, bee pollen, eleuthero, Pacific kelp, and therapeutic-grade essential oils, rosemary, lemon, lemongrass and Melissa. Everyone knows that greens are essential to our human diet and a natural, sustainable energy source. Greens are concentrated nutrient power houses that support many body systems. Green foods support a healthy well balanced diet, right? Well, if you don’t know for sure, just ask your grandma. She will remind you. This supplement provides another way to get greens into your body. The combination of Spirulina and Barley grass separates MultiGreens from the super green food supplement shelf, but this still does not explain why Young Living’s MultiGreens is the super supplement of green food supplements. What makes Young Living MultiGreens different? Absorption. D. Gary Young, Young Living’s founder formulated MultiGreens with the power of greens along with essential oils. According to D. Gary Young, “After adding the essential oils to the formula, blood absorption increased to 64% in 30 minutes and 86% in 1 hour. The conclusion was that the cells were now receiving nutrients that they had previously not been able to assimilate. The addition of Rosemary, Lemon, Lemongrass and Melissa essential oils provides the added support of immune, memory, gut and digestive support to this multi green supplement.” There you have it – right from Gary’s mouth.